The sewer gentleman was a meticulously groomed Italian immigrant who walked about the house after inspecting the drain in question. After some harumphing, he declared he needed to do some tests which included running dye through the various downspouts around the house and drains in the house. Contrast drainography! To top it off, he wanted to run a camera on a flexible tube through to check out the drains. Endoscopy! Plumbing, he sniffed, was easy, but drains were an art. For the record, our basement was dry, but I could see the money meter whirring away. It was only a few weeks removed from a spring storm where several homes a few blocks away had catastrophic flooding when rains overwhelmed the capacity of their drainage –Drainage Insufficiency! The testing was fine, but he ended up recommending resealing the entire East side of the house and rebuilding the window wells, because while the house was dry, it was compensating by rerouting a lot of drainage down gutters and the downsloping lawn to the street –Collaterals! and he couldn’t promise the house wouldn’t flood with a torrential month of rain which Shaker Heights is prone to being downwind of the Lake. And it is with this wisdom that I see the increasing numbers of chronic venous occlusions. For example, the patient whose venogram is pictured above initially complained to her obstetrician of persistent heaviness in the pelvis and swelling of the legs after delivering a healthy baby. MRV showed abundant pelvic collateral veins and she was referred to me. Our first test in our clinic is a venous duplex of both legs and the abdominal veins. There was an occlusion of the inferior vena cava below the renal veins extending the the iliac veins bilaterally. I am about to give a talk on this and I composited the ultrasound. She had iliocaval occlusion, chronic. Her symptoms were over two years, and were ever worsening. She hadn’t developed permanent skin changes of chronic venous insufficiency, but probably would in a decade or sooner. I recommended venography and an attempt at recanalization. The procedure went well, and her symptoms abated. For my trainees, the absence of collaterals in the after image is the sign that hemodynamically, the revascularization is the preferred route of egress. Surprisingly, this has stayed open over two years, but again, my exceedingly well paid sewer gentleman consultant, had something to say about it. Drainage, he declared, was different from plumbing, because things move slower and there is usually solid matter -poop, leaves, dead birds, etc., to contend with. Larger, high volume drains do best with a direct in-line connection with the city sewer, while downspouts and window wells with their twists and turns and only occasional flushings clog up too well. Wise words. It gave me a reason why iliocaval venous interventions did so much better than femoropopliteal ones. Venous interventions connect confluences to the main drain, in most cases the suprarenal inferior vena cava. 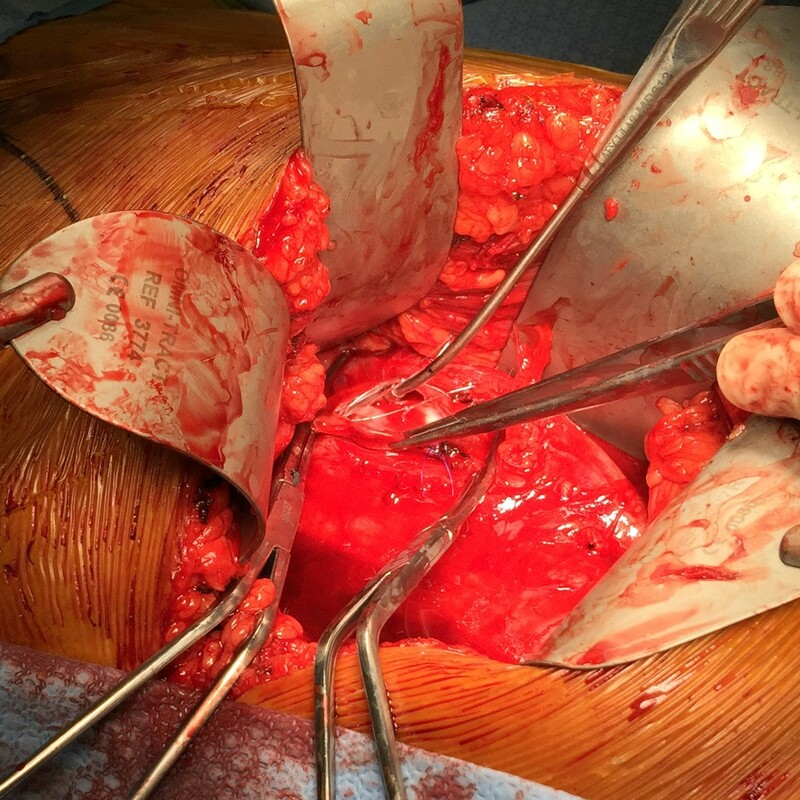 The iliocaval segment drains the common femoral confluence, which even in the worst of chronic lower extremity DVT’s, seems to reopen with several months of anticoagulation. Not the same for the popliteal confluence which, getting much less blood flow to drain, and having a smaller diameter, stents in the femoropopliteal veins just don’t do as well. Plus, it has to drain against a greater hydrostatic pressure. The drain guy’s wisdom seems to apply. It also has implications for the kind of stents we place, and the kinds that are being developed specifically for the venous side. The patient had a carotid dissection over five years prior to presentation and had a stroke and DVT. To protect her from pulmonary embolism, an IVC filter was placed, she was anticoagulated for a while. She rehabilitated and was doing well when several months prior to consultation she developed severe upper abdominal pain that occurred intermittently without triggers. She underwent a workup which included laboratory testing and endoscopy which were negative, and a CT scan showing the IVC filter had tilted and the legs had eroded through the vena cava to abut the duodenum and abdominal aorta. No other pathology could be found and after discussion operative resection was planned. 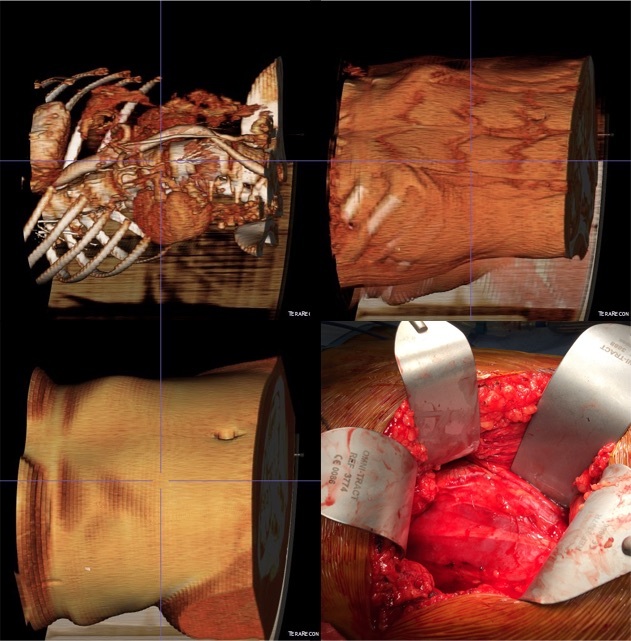 As mentioned in an earlier post, 3DVR image processing has become indispensable in planning not only aortic interventions but open surgery as well. An oblique incision was created, basically a high transplant incision, and we stayed in the retroperitoneum. The leg of the filter abutting the duodenum did not penetrate it and there was no leakage of bile. The end of the leg, of which there are two types on this filter, was in the vena cava, but the side had eroded out of the cava. 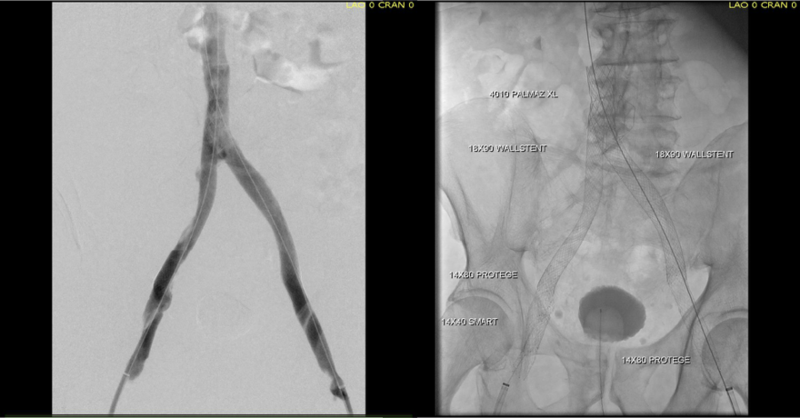 Control of the IVC is always treacherous because of the fragile lumbar tributaries underneath the cava. Once heparinized and clamped, a longitudinal venotomy released the filter. The head was embedded in the cava wall and would not have been easily accessible with a snare. The tine that was headed towards the aorta had to be removed from the filter to manipulate it out. No bleeding was noted from the aorta. 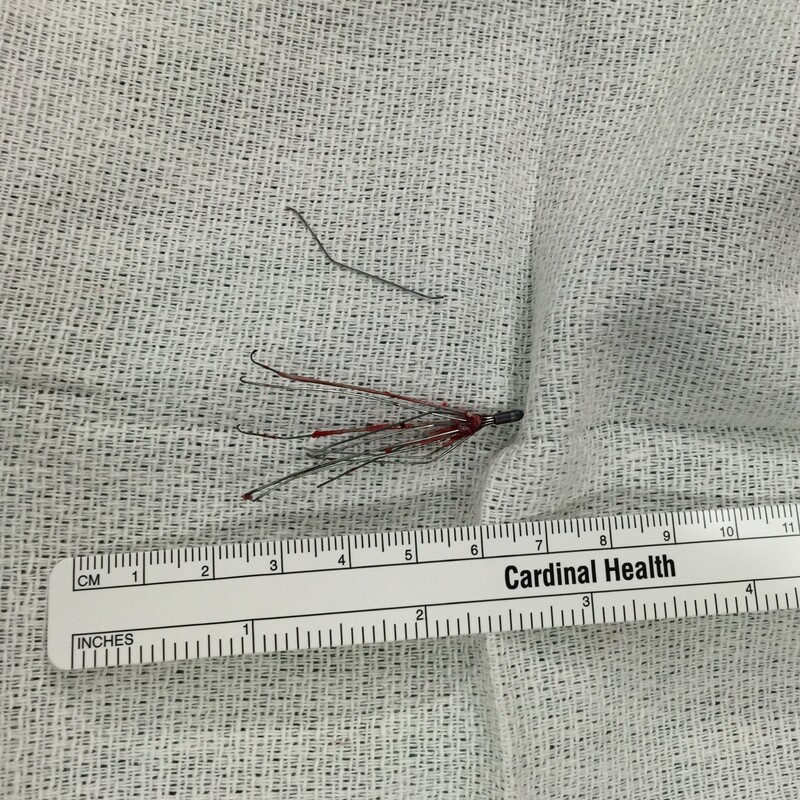 This is my fifth operative removal of an IVC filter that had eroded into adjacent organs. Recently I removed a filter which had eroded into the aorta -this required a pledgetted suture. In my first case, about 7 years ago, a filter placed in a teen, the victim of polytrauma due to an MVA, caused fevers and an upper GI hemorrhage which was diagnosed on upper endoscopy -somewhere I have a great picture of an IVC filter leg in the duodenum. Which brings me to my last point. The guidelines for placing these filters has evolved and it is clear now that they are not as benign as once thought. 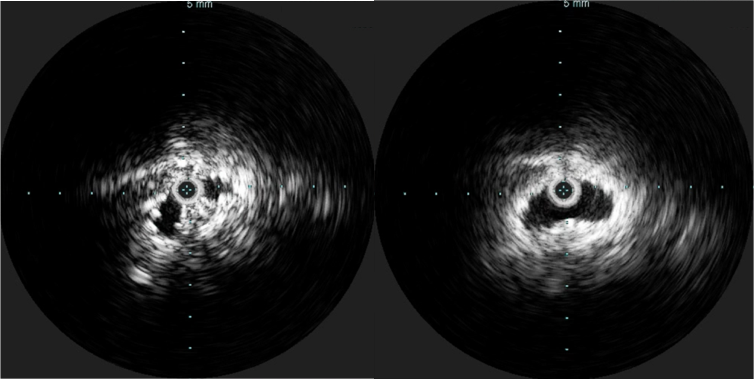 They are not only associated with migration but also iliocaval thrombosis. Stenting across them can push the legs out into organs. 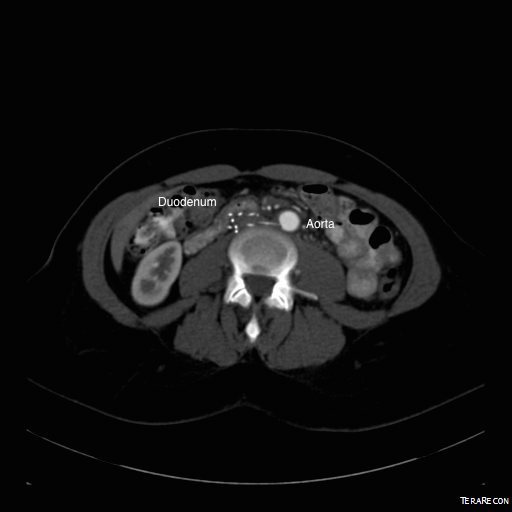 Their migration into the retroperitoneum can cause an atypical abdominal pain syndrome -in this patient, the pain was immediately gone. If placed, plan should be made for removal if feasible, anticoagulation maintained if possible, and filter choice limited to those that have long track records. The treatment of venous thromboembolism remains primarily pharmacologic. When the indication for the filter expires, the filter should be removed unless the risks of removal exceed the risks of leaving it in.